Bharatiya Janata Party’s union minister Nitin Gadkari has exposed the inefficiency of his own party government in Goa, presently led by Laxmikant Parsekar. 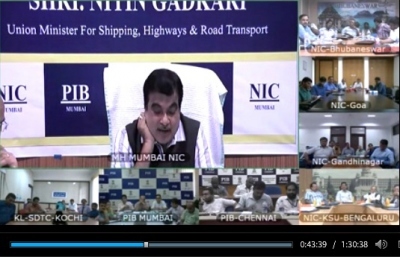 In a video conferenced media chat with western region, Gadkari today revealed that the proposal of starting commercial ferries in Goa’s waterways is stuck up due to the NOC not given by the state government. “I request you media people also to talk about this to the chief minister and get the NOC issued. I have told them several times. I will again talk to the CM when I am come to Goa tomorrow”, Gadkari told a public video conferencing. According to Gadkari, his shipping ministry had mooted the proposal of starting a commercial ferry service from the Mormugao port to the respective hotels all along Goa’s coastline, to drop the tourists. “It can be started by the private parties or even Goa government. It would be a major tourist attraction of Goa”, he said. Gadkari however sounded upset over the delay in granting NOC for the proposal. He said he would speak to CM Parsekar once again when he comes down to Goa tomorrow to attend the port chairmen’s conference. A question in this regard was raised by Navprabha editor Paresh Prabhu as well as Indian Express correspondent Harsha Raj Gatty. The video conferencing was organised by Press Information Bureau, in association with the National Informatics Centre. Why Goa Assembly’s media guidelines sound to be a cruel Joke! Remo gets a 'rebirth'; Social Media ‘kills’ him! Parsekar Formula: Don’t come on the road, get your demands solved!